Ever since I was a little girl, I've loved Ewoks. I'm pretty sure that back then, my mom wouldn't let me actually watch Return of the Jedi, but I still knew all about these creatures. To me, they were cute and cuddly, and I even had a stuffed Ewok. She was gray with a pink hood. So cute. Well, today is May 4th, which means it's Star Wars Day! I still love the original three movies (the new ones? meh. 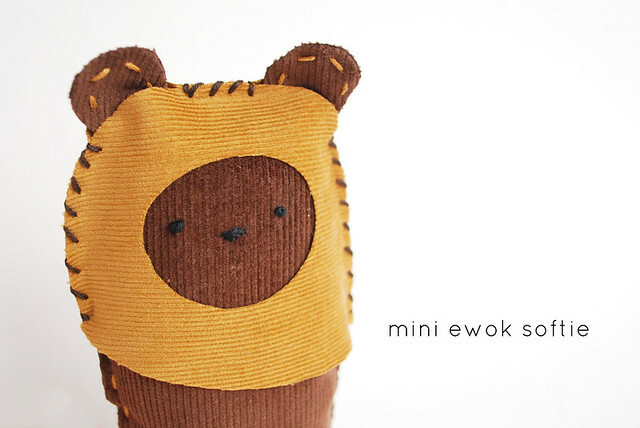 ), so I couldn't pass up the chance to celebrate with a little softie Ewok! 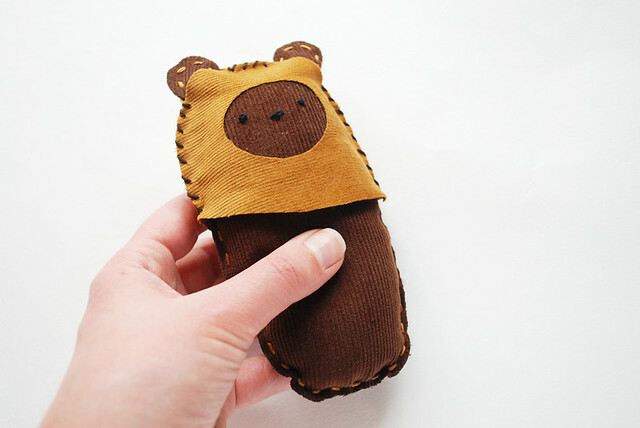 They are really quick to make, and are safe for even the littlest Star Wars fan to love. Stitch the face onto one body piece, and cut an opening in one hood piece. 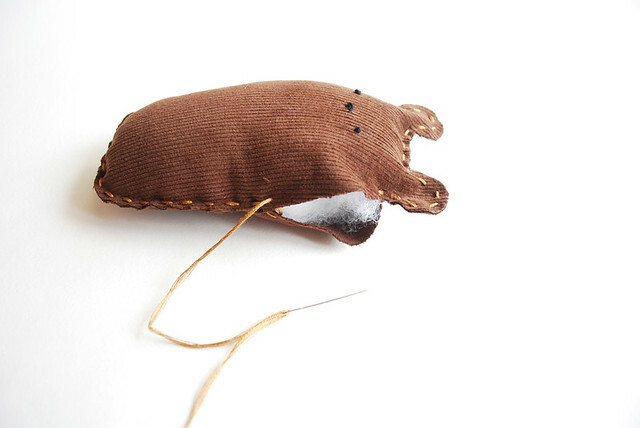 Pin the body pieces together, and sew around the edge with a running stitch, leaving an inch or so for stuffing. Stuff him and stitch him closed. 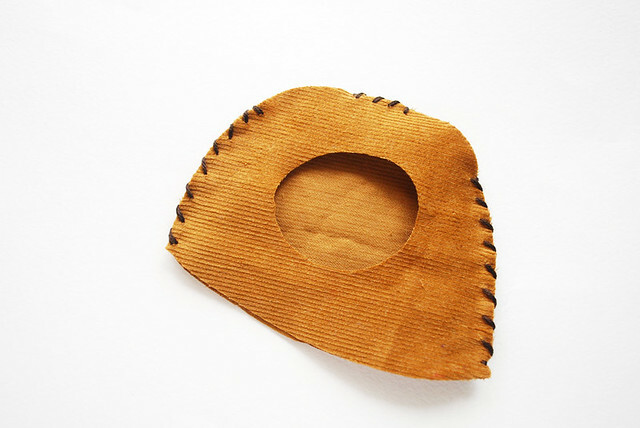 Pin the hood pieces together, and sew around the edge with a whip stitch, making sure you leave openings for the ears. 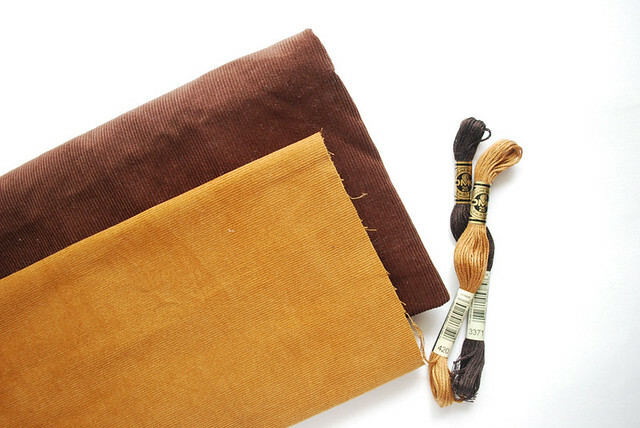 The pattern is marked for these openings, but it's a good idea to make sure that your openings match up with your Ewok, as some variation can occur when cutting and sewing. Okay, well that's actually my front yard, but whatever. He looks at home, doesn't he? My 24-year-old sister has claimed this guy, and I've already got a list of people in my friends and family who are going to need one. I think I'll be heading to the store for more colors of corduroy so I can stitch up a whole colony! Yep. Me with Wicket. I'm just that cool. Happy Star Wars Day, friends! And may the force be with you! I too have great memories of watching Star Wars as a kid, thanks for the project it's too cute! Love this!!!! I was raised on Star Wars - the original! I think my sister's cat (Lowell) needs one to add to his ever expanding toy collection (it will go well with the Tribble he already has). so much cute! Thank you. Thank you so much for this post. I want to let you know that I posted a link to your blog in CBH Digital Scrapbooking Freebies (please, notice the new url for my blog), under the Page 6 post on May. 04, 2012. Thanks again. So cool....my son (35) is going to need one of these. Love the pic...especially the charm necklace. It is indeed a charm necklace...and I still have it! That is so funny. I need to make one for my nephew. I need to figure out how to make a Chewbaca one. He would love that. And your childhood one is a crack up. The scale is totally different, but there's a fantastic pattern for Chewbacca on Draw! Pilgrim (hence my leftover corduroy!). Laughing pretty hard. This is awesome! Adorable! I think you need to add your your May the 4th collection every year! Maybe next year will be a little Yoda? Hey Mollie, I had a necklace just like yours too! I keep it in this shadowbox frame, and actually, there are two in there. The day I met this Ewok happens to also be the day I got the skeleton charm. Crazy thing to remember, but it was obviously a big day for me! You have totally made my millenium . . . falcon! Heh heh. I'm a HUGE Star Wars fan. How sweet! I Love Ewoks too! I've never heard of Ewok but he is definitely cute!! ohmigoodness... I'm so jealous you still have your charm necklace!! I had a wicked-cool harmonica and an ice skate with a bell on it. Seeing pictures of yours gives me warm fuzzies. Very cute! love the tut too! May the 4th be with you too! I loved Ewoks as a kid too. There were some spin-off movies that weren't as scary as the real Star Wars that I remember watching. Anyway, my son has seen enough Star Wars to love Ewoks too so he will be thrilled if a couple of these appear someday. 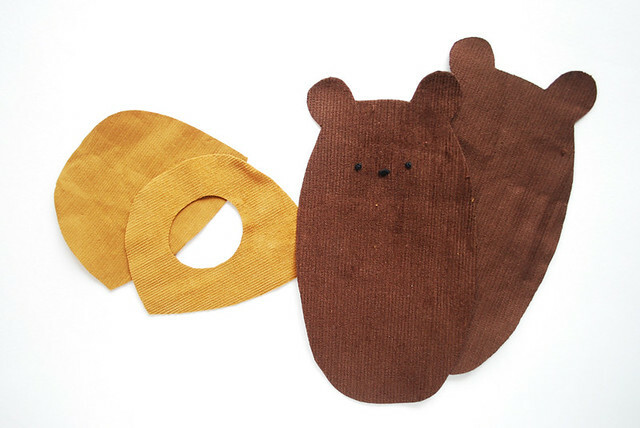 I am thinking maybe some thrifted corduroys would be perfect for making these! That's awesome! 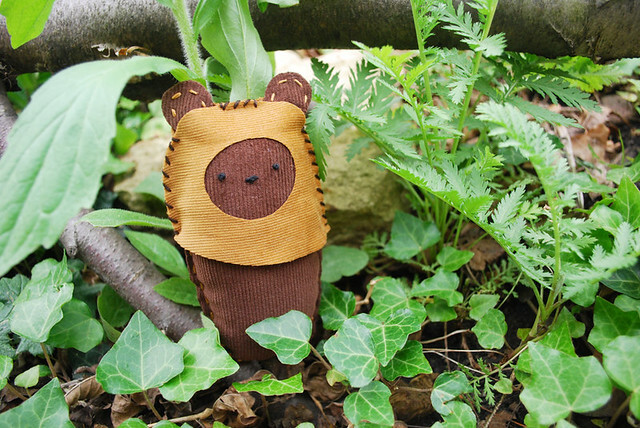 Why didn't I think of Ewoks when I made my R2 and Chewie fingerpuppets!? Awww so cute! 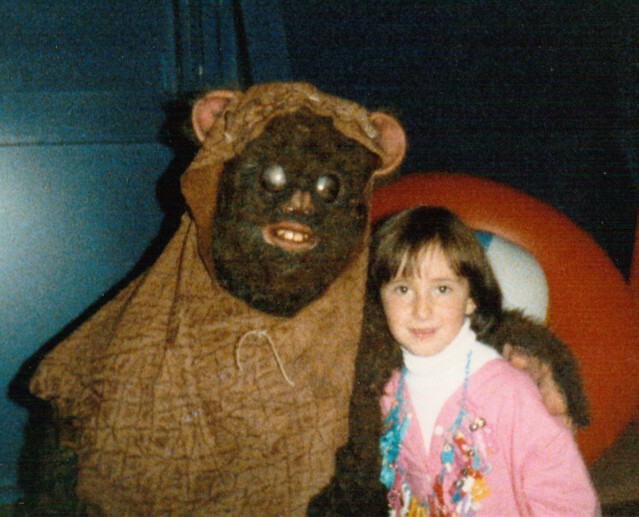 The ewok with you in the photo looks a little scary though lol. Also I love the mama & baby sloth pattern you posted. Cute overload!